Traveling to see family or to go on vacations is (usually) a whole lot of fun! Great memories are made and bonds are strengthened. There is always concern, however, of how it will impact your life and your baby’s life both during the vacation and after the vacation. Chances are you have made a lot of sacrifices to have your baby sleeping how she is, and the idea of negating that effort is scary. There is also a very real, and justified, concern over how the baby will be while on vacation. Will baby sleep, or will baby be up all night crying? How will that impact the other people in the house? You don’t want to keep everyone up. Will you even have fun if you are up all night with the baby (I have been on those trips that are not so fun for me because of things not going well with baby!)? Is it worth it?!? I mean, the packing list alone is enough to keep people home. Despite those fears, concerns, and work, you have decided to go on a trip. I think that is a wise choice. At least give it a try and see how it works out. Now you are left wondering what you should do about sleep while traveling. What do you do if baby wakes early from a nap? What if baby won’t even fall asleep for a nap? What about night sleep? Will all of baby’s progress be totally ruined?!? Aaahhh! Take a deep breath. Go in with a game plan. It will work out. This post contains affiliate links. This is the same as my first goal in the Newborn Sleep Hierarchy. Your first goal when traveling is just to get baby to take a nap at nap time and go to bed at bed time. You don’t want an overly tired baby. Overly tired babies have a hard time sleeping and also aren’t fun. They cry a lot, which means people can’t enjoy baby and you can’t enjoy yourself, not to mention your poor baby who can’t stop crying. If baby will go to sleep as he usually does at home, fantastic! That is ideal, of course. Not all babies will do that, however. The house might be super noisy and make it hard for your baby to sleep. Your baby might not be as flexible of a personality type and might find it hard to sleep in a new environment. You might be out and about and not have a bed available for your baby to sleep in. So you might find baby sleeping in a car seat, in the arms of someone, or even in a swing. When Kaitlyn was a baby, we literally brought her big old swing with us to Nate’s family’s house when we went. It was super noisy and she wasn’t used to sleeping with noise. A swing was a way for us to make sure she could fall asleep when needed. Side note, I had dreams of a travel swing after Kaitlyn, but it turned out my next two babies both hated the swing, so we never traveled with a swing again. We have been known to bring a pack and play, bassinet, or pea pod with us so our baby can sleep. Once I discovered white noise, I also brought that along with me to help block out noise. I have often nursed a baby back to sleep in the night who has previously been sleeping through the night with no feedings for months. If you are out and about, see if you can get baby to fall asleep at nap time in the carseat, in your arms, or in your baby carrier. Even if your baby only takes a 45 minute nap, it is better than zero nap. 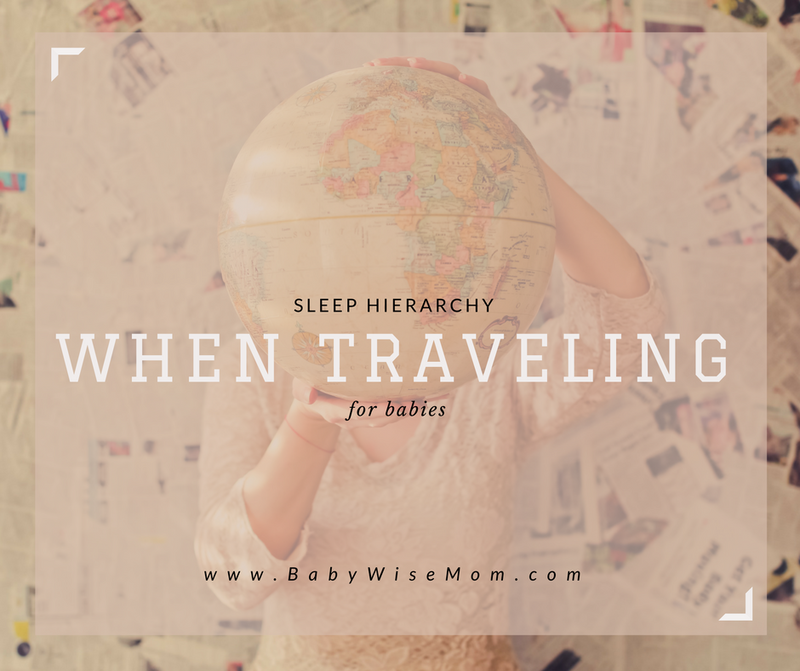 The point is, you often have to do what it takes to get your baby to sleep while on vacation. Doing those things is better than your baby not getting sleep. That doesn’t mean you will face zero consequences when you get home. Just because you had to doesn’t mean it won’t take some retraining once you get home. Just do not be afraid to do what your baby needs to get the sleep she needs. Sleep is most important here. If you are able, a nap in a bed is always preferable to a nap on the move. It is more restorative. It will help keep your baby on track so that when you go home, you don’t spend 1-3 weeks trying to get back to where things were before you left. Goal #1 is the most important for traveling and sleep. You might not even broach goal #2 at all, and that is okay. This is your call and you will make it based on a whole myriad of factors. Some trips are short and you might choose to not worry so much about sleep while on that trip. Some might be weeks and you want to keep things as normal as possible so life isn’t so disrupted when you get home. Some babies are flexible and adaptable while others just aren’t. Some can be tired and still content while others will scream. Sometimes you are visiting family that you might only visit once in a very great while. Decide what is best overall based on your unique travel situation. Know your child and be an advocate for your child. If you baby is more flexible, you might allow her sleep to be disrupted to give family more time with her. If your child is not flexible, however, make sure you do what she needs you to do as her parent. I always say, baby’s needs come before adult’s wants. 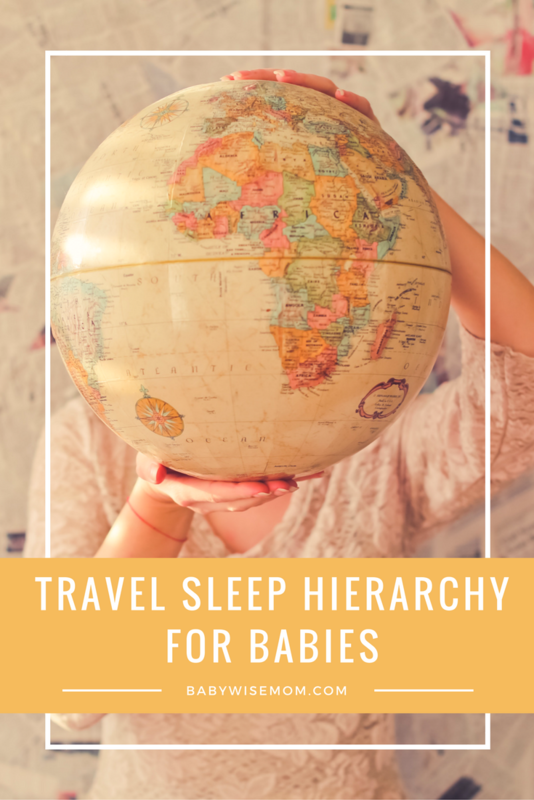 Place to sleep (pack and play, bassinet, pea pod, moses basket…a place your baby would ideally sleep on her own while you are traveling). Back-up sleep location (sling, carrier, swing…what are your back-ups at home? You might like something on the road). Normal sleep attire. Swaddle blanket, lovie, types of pajamas, socks, pacifier…whatever your baby normally sleeps in and with, have it with you. Alternative sleep attire. Also, have an alternative to what your baby is sleeping in at the moment. When Kaitlyn was a baby, we traveled to my grandmother’s funeral. At the time, it was July and Kaitlyn’s room at home was very hot. We traveled to a state where the nights even in July are often in the 30s. We ended up sleeping in my aunt’s basement. Kaitlyn woke up a couple of times that night because she was cold. We should have brought warm pajamas, not just the light pajamas she was sleeping with at home. Stimulation blockers (sound machine, something to cover a window, something to block you at night from eyesight…). People often worry that they will negate all forward progress by going on vacation or having some disruption of some sort. That is not the case. Like I said, different babies respond differently. Some get home and slip right back into the normal routine. Some take a day or two of fussiness to get back to normal. Some might take a couple of weeks. No matter how long it takes, it won’t negate everything you had previously achieved. Plan on taking a few days to be super consistent when you get home so your baby has the best chance at bouncing back quickly.